Greetings from the EHA stand at the Hannover Fair 2013! This year EHA along with the Spanish, Latvian and Italian Hydrogen Associations is featuring the current and future status of hydrogen station development in Europe in view of the EU Clean Power for Transport ambitions. 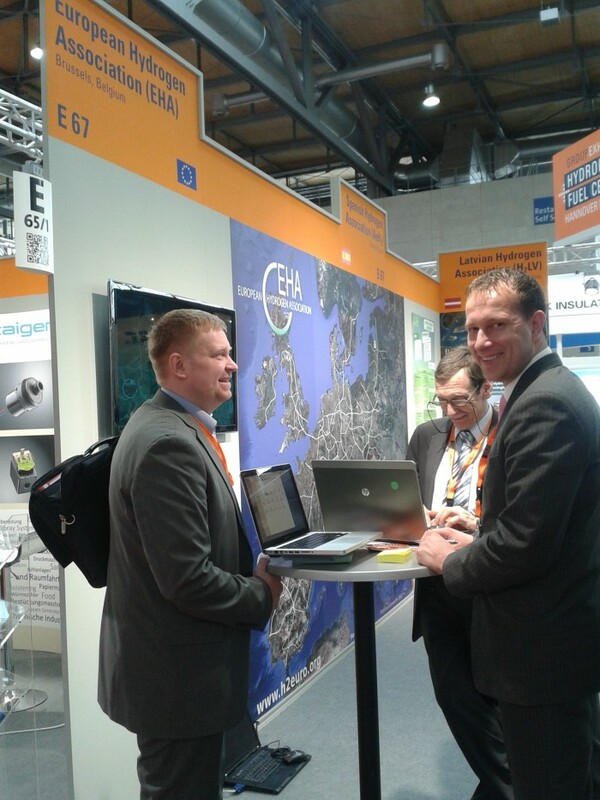 The EHA stand is featuring a map of Europe with the current and planned stations and visitors are asked to put a sticker where they wish a hydrogen station to be built in the near future. EHA Executive Director Marieke Reijalt, as coordinator of the HyER office in Brussels will be presenting local hydrogen developments at the Better Transport Forum on April 9 at the Metropolitan Solutions fair that has shown a significant increase in clean urban energy and transport solution provides as well as a larger number of visitors over the past few years. The EU Commission published its Green Paper on a 2030 Framework for Energy & Climate Policy. Although hydrogen is not specifically referred to in the paper the objectives for 2030 commits to supporting progress towards a competitive economy and a secure energy system by creating more demand for efficient and low carbon technologies and spurring research, development and innovation – good news for employment and growth as the EUs new efficiency standards (for cars in particular) have the possibility of creating up to 443,000 new jobs, according to a recent study by Cambridge. The EHA has been informed that the EC is facilitating various national round tables on the EU proposal for a Directive on the deployment of alternative fuels infrastructure (COM 2013/18) ( which hydrogen is mentioned in article 5) starting this month. These round tables might be a good occasion for EHA’s national association members to ensure that the role of hydrogen in future transport infrastructure is explained in these meetings. EHA continues to expand into new territories, an invitation from its newest member, Romania to present it activities and talk about the role of national associations and local communities in the roll out of hydrogen infrastructure while EHA’s industry member, McPhy Energy will work to develop a new hydrogen solution for the Colombian market with plans to establish a renewable hydrogen fuel production facility in Bogota. 3 April, 2013The development of a hydrogen economy in London will help support the Mayor’s ambitions to secure new jobs and investment whilst at the same time reducing environmental impact in the capital. 3 April, 2013Robust fuel efficiency standards for cars could create up to 443,000 new jobs by 2030 and add €16 billion per year to Europe’s GDP, according to the first economic study of the effects of CO2 legislation on the auto-industry. 3 April, 2013Twenty-seven new hydrogen refuelling stations opened worldwide in 2012, bringing the total number of hydrogen refuelling stations in operation to 208 as of March 2013.